A great overall face wipe! I find that this product works in a very similar way to the original Swisspers wipes, which are an excellent product. I'm not convinced that the coconut / micellar ingredients really add anything of value to the product, however it doesn't detract anything from it either. The smell is subtle and is very similar to many other make up wipes. In terms of make-up removal, this product does an excellent job, even with waterproof make up! I got a duo pack of these wipes in a show bag and I must say I never normally use more than 1 wipe at once so I like to be able to reseal my wipes. Once the duo pack is open, you basically have to use both at once otherwise the second one will dry out. I do like the packaging otherwise with the coconuts pictured. The wipes are quite large in size and you only need one wipe to remove all makeup. I did find the wipes were not as moist as expected making it harder to remove makeup with ease. The wipes I did not find as soft in comparison to other brands of makeup wipes that I have used before. Overall I would probably not rebuy due to the package not being resealable and the wipes feeling too abrasive against my skin. I really like these wipes. They are quite large, rectangular sheets so one is all you need to cleanse the whole face. The fabric is also nice and soft with the perfect amount of moisture. What I love most about these wipes though is how gentle they are on the eye area - I really have sensitive eyes and these don't sting or irritate them at all. They are also great at removing eye and face makeup - I use it after my usual eye makeup remover and was amazed at how much more eyeliner came off. These clean thoroughly and have a lovely coconut scent as well. These would be great for travelling or for every day use. They soothe my skin and are mildly hydrating too. There's really nothing I don't like about these wipes. Five stars! I’m a massive fan of the swisspers wipes as I can get all of my makeup off with one wipe. I know they can be a bit more pricey than other brands but with a nice thick and moist cloth, I find myself using a few wipes with other brands. I was excited when I saw these because I love miscellar cleansing and I adore coconut. The fragrance is low, which I love, because I was expecting to get punched in the face with that artificial coconut scent, and I didn’t do my sensitive skin appreciated that. I don’t enjoy washing my face and try to find options that let me get my makeup off without having to warm up water and cloths etc so I love this product, especially now I’m pregnant with no motivation to move! The smell is amazing and makes you smell super clean and fresh instantly, and although my skin feels a little dry after using them, it feels clean. All I do is finish off with a splash of moisturiser to bring the moisture back. Definitely my favourite wipes to use from all I have tried so far. Anyone who can’t be bothered washing their face every night! I was super excited to try this product coz I was intrigued by the coconut water and Miceller!As a positive I can say that the wipes are very moist and do smell nice. I was dissapointed because I found it never really took off my mascara. I always had to use extra miceller water on the wipe to do so. I had been using these for maybe 3 weeks until I realised I was getting red, itchy, irritated skin around my eyes! They were the only thing I had added to my usual makeup routine so I decided to research the main ingredients in these wipes. Aside from being full of harsh chemicals and alcohols these wipes also contain Benzoic Acid. Side effects of Benzoic Acid include eye irritation, redness, broken skin,itchiness, burning and rashes. Unfortunately I copped all of these side effects! :( I do not suffer from sensitive skin but I recommend that those of you that do, DONT USE THESE WIPES. They are simply too harsh. I'm not a regular makeup wipes user. I keep wipes on hand for when I stagger to bed with a migraine. (Too frequently, alas!) These makeup wipes are the driest I've used! I had to rub harder than I'd like, in order to remove my mascara. Despite being rather dry, I feel like these wipes leave a residue on my skin. The adhesive tab opening is covered by a plastic snap lid. I like the secure closure because it takes me a few months to use up 25 wipes. The fresh scent of coconut water is very mild. I expected more of a coconutty smell. My blemish-prone skin has had an outbreak lately. I'm not sure if the cause was my makeup not being removed adequately, or the residue of the wipes themselves. It's probably a combination of these two factors. REPURCHASE? No. There are better wipes available: Wotnot, Simple, Bioré. INGREDIENTS: Aqua, PEG-6 Caprylic/Capric Glycerides, Glycerin, Propylene Glycol, Phenoxyethanol, Cetearyl Isononanoate, Glyceryl Stearate, Cetyl Palmitate, Cetearyl Alcohol, Ceteareth-20, Ceteareth-12, Polysorbate 20, Disodium Cocoamphodiacetate, Sodium Benzoate, Cocos Nucifera (Coconut) Water, Ethylhexylglycerin, Benzoic Acid, Disodium EDTA, Hexylene Glycol, Cocos Nucifera (Coconut) Oil, Dehydroacetic Acid, Parfum. I bought this after reading the trial team reviews but unfortunately, it didn't work out for me. I like that it has a subtle, 'real' coconut scent and comes with a hard plastic closure - very pretty packaging. I find the wipes not moist enough, dry and quite rough. Thus, they also slightly irritate my skin. I made my sister try it too and she said it stung her skin a little. I need to use some pressure to get all my makeup off. It leaves a film behind which I dislike and have to rinse off with water. Overall I wouldn't repurchase or recommend, but I purchased a double pack so it'll be great for refreshing gross summer skin on hot days out. UPDATE: above is my original review. I'm now almost finished with the double pack (so 50 wipes total) and I've bumped it up from 2 stars to 4 stars. It's grown on me and now I actually kinda love it. The first pack I used was probably a dud. When I moved onto the second pack it was perfectly moist, removes mascara all off, heavy eyeshadow etc. I still like to use some water on a tissue to wipe off the residue after. Overall I would repurchase again BUT the wipes need to be more consistent in quality... You might get a dry pack or a wet pack... it's like a lucky dip which I'm not a fan of, as evident in the other reviews. Overall, one of the better wipes out there if you get a good one. Removes heavy makeup swiftly, doesn't irritate skin, is gentle on skin, very nice, non-artificial coconut scent, durable thick wipes and great value for money. These makeup wipes combine two great products into one. I am a huge fan of micellar water and anyone that has tried it out knows how amazing it is at removing makeup. Makeup wipes are easy to use and great for when you're too lazy to wash your face but still want to remove your makeup thoroughly. Now these combines both of those products into a great makeup wipe! The wipes are thick and durable making it easy to use on your skin without having to worry about it ripping or shredding. The size of the wipe is good as there is enough space to use it for your whole face, eye makeup included without having to use another wipe. Like one of the swisspers makeup wipes that I used I found that the wipes weren't that moist which was disappointing as I like mine saturated with product. When it came time to actually use it the makeup wipe did a great job of taking my makeup off, including my mascara and eyeliner. The coconut water kept my skin hydrated while the micellar water did a great job of removing my makeup without leaving any residue behind. I liked that the packaging had a clasp which ensured that the products wouldn't dry out. It's the perfect size for travelling and I love that even for my oily skin it works well. All skin types looking for a makeup wipe with the benefits of micellar water! I have been using micellar water as an eye make up remover for about 6 months now but then follow up with cleansing wipes so I was really excited to try this new product which I could use for both! Firstly the packaging is great, I really love cleansing wipes which come in a resealable pack as they keep the product moist and long lasting, also the scent is amazing. I love anything coconut and this did not disappoint. The wipes themselves are thick and sturdy and I really felt did a great job of getting rid of all my make up so will definitely be purchasing again! 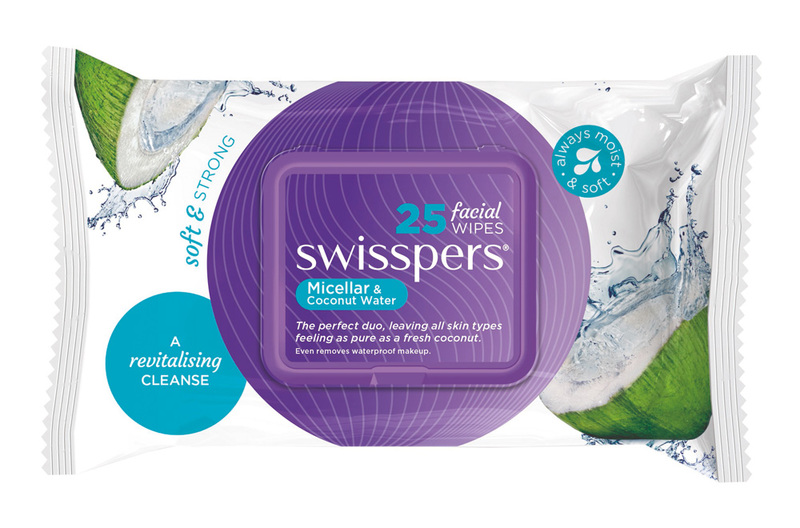 I have been using facial wipes for years, along with Micellar water, so I was keen to try the Swisspers Cleansing Facial Wipes with Micellar & Coconut. The packaging is really eye catching with its nice purple centerpiece over a white background with splashes of blue and lime green. This is one of the best, if not the best, packaged facial wipes I have seen because of the large, resealable, plastic flip top opening which makes it easy to access the wipes as well as for keeping them moist. The wipes are a decent size, are thick, firm and soft which means they glide easily over the face without bunching up or tearing. I love the fresh, summery coconut fragrance. The best thing about these wipes is that they really remove all the makeup from my face. I always follow up removing my makeup by wiping over my face with Micellar water on a cotton pad to ensure all traces of makeup are removed. When I do this after using the Swisspers Cleansing Facial Wipes with Micellar & Coconut the cotton pad is perfectly clean which means the facial wipes have done their job perfectly. I have combination to dry skin and these wipes left my face feeling soft and moist, with no drying effect whatsoever. Thanks Swisspers for another fantastic product. Always have a spare pack so you never run out. mature, dry skin but anyone should be able to use them. I have been using Micellar water in a bottle for quite a while and I do love the product but I would rather just buy one product to clean my face rather than a bottle of micellar water and cotton pads which can add up in price. I was so excited when I heard of this product because it's all of my favourite things all in one convenient packet! The wipes come in a resealable packet which is so handy to take with me in my bag or keep in my cupboard and won't dry out. The wipes themselves are so soft and gentle on my skin and take all of my make up off very well. I some times get quite sensitive skin so I can be a bit hesitant when it comes to facial wipes but these are perfect for my skin and the best part is it leaves my skin feeling soft, clean and smelling beautiful! I will continue to buy this product as it ticks all the boxes! Anyone looking for a great facial cleanser. Wisspers micellar and coconut water wipes was a great product to trial especially being a loyal consumer of another cleansing wipe. As soon as I opened the package I was very impressed with the packaging, the design especially made it feel like a fun product! The opening of the product is unique and I believe it really helps avoid the wipes drying out and also making it very hygienic if multiple people are using it.Love that Micellar water is used within this product because it was great benefits for the skin. The coconut water was a surprise but this wasn’t my favourite part. The smell wasn’t nice at all and I actually didn’t like the scent on my face. Another thing I noticed it the wipes contain a lot of moisture so I had to keep wiping my face with a towel to taking the water off. It did remove all my makeup and even days when I didn’t wear makeup made my skin clean and refreshed. Love the packaging! They do the job nicely! I've been using makeup wipes for a long time and I have to say the Swisspers Micellar and Coconut Water Wipes have the best packaging by far! They have a plastic clip shut opening similar to baby wipes which means the wipes don't dry out when the plastic opening stops being sticky! Love it! I also love the texture of the plastic wrapping. It feels expensive, like there's no cheaping out in this packaging! The wipes themselves have a slight coconut fragrance to them. I don't love it and I don't hate it. It wouldn't stop me from buying them but I feel it could be a bit better. The only thing that let this product down in my opinion was the texture of the wipe. It wasn't quite soft enough for my liking and felt a little harsh on my skin. I've had harsher but I've had softer too and as a result I probably won't stray from my usual brand to buy these on a regular basis. That being said the wipes do their job with no problems at all. I had no issue removing all of my makeup, including mascara with these wipes and they did leave my skin feeling soft and clean which is ultimately the goal! I am not really a big fan of face wipes. I normally like to use cleaners and then rinse my face. But when I received this product I tried and actually ended up liking it. I wipe my face with the wipes at the end of the day and the smell make me feel fresh. I was scared that the wipes might make me breakout but luckily it did not. My skin is very sensitive and I get breakout very easily, which is why I was reluctant to try this product. These wipes are very good especially for hot weather. Even if you are not wearing makeup you can wipe your face with these wipes and feel fresh. I also like the smell of the wipes. I agree some people might not like the smell of these wipes especially if you are someone who does not like that that coconutty smell. I must say I have been a fan of Swissper's and their products for many years now. And with their new Micellar and Coconut Water my love for these product's has only grown stronger. The bright little soft square package with it's beautiful colour of purple (my favourite) and aqua is vibrant and eye catching. It has a simple flip top lid, and the wipes are easily exuded from the package. They are on first glance bigger and thicker than the usual facial wipes I've used in the past which is excellent for someone with big hands. I allowed myself a few minutes for drying when using these wipes. I found that straight after using, my skin felt a little tacky, but after just a few minutes my skin was dry and soft and felt really cleansed. This surprised me as my past experience with wipes hasn't always been favourable with residue left behind and makeup. I can gladly say this didn't happen with Swissper's Micellar and Coconut Water wipes. My skin felt fresh and rejuvenated and most importantly hydrated which I really appreciated. I don't wear heavy make-up so I can't comment on the wipe's effectiveness with that, but I can say that it removed my natural looking day make-up with ease including all the eye area...Winning!! I am really happy with the overall performance of Swissper's Micellar and Coconut Water Wipes. It's a great product for people who love to do things quick and have limited time frames. They are easily kept in your bag if need be and really don't we all just love a performing product, so I will be definitely buying again. Thank you Beautyheaven and Swissper's. Good packaing! Wipes stay fresh & moist! Facial wipes have been one of the greatest inventions for the busy modern women on the go. They save time and can be used anywhere! I love that convenience as a busy modern woman myself. Straight away this product's packaging has me drawn in and catches my eye. The white, turquoise blue and deep purple are a really pretty pop of colour amongst my daily products. The packaging also feels like it's biodegradable? I would love confirmation on this feature. The snap lock lip is very secure and easy to close and open without force. This keeps the wipes moist and fresh which is essential. The wipes have a very subtle coconut scent which isn't too sweet or artificial smelling. It also smells a little fragrant but it is very light which is nice. The wipes I would say are an average size but are enough to get the job done. After a long day of work all I want to do it go home & change into comfy clothes and take all of my makeup off. These wipes have been my go to as soon as I get home each day. They feel so good on my skin. They just wipe the day away and make me feel so refreshed and relaxed at the same time. Theses wipes remove my makeup easily. I generally only need one wipe and that does foundation, lips and eyeshadow and mascara. So that is pretty great for a 25 pack to generally last about 3 and a half working weeks. For the price, in my opinion that is pretty good value!  Overall, I have been very happy using this product and will continue to do so. I would absolutely purchase these on my next weekly shop! These rate higher than other facial wipe brands for me mainly for their clever packaging, scent and ease/effective use. Thanks for taking the time to review our product - your feedback is very helpful. We're really pleased that you like the packaging - at this stage it is not biodegradable, but it is something that we will be looking at for the future. Thank you Beauty Heaven for allowing me to participate in this trial. The Swisspers Micellar and Coconut Water Facial Wipes work amazing! The wipes come in a plastic packaging and snap lock lid on the top to access the wipes, which also helps keep the wipes moist and also easy to pop them into your handbag. The wipes are thick enough not to rip apart and are extremely soft to touch. These facial wipes have a slight coconut smell to them which isn't overwhelming. I personal only needed two facial wipes for my whole face which was covered with full coverage makeup and also water proof mascara. The wipes were moist enough so no extra water was needed. I use these wipes in a circular motion starting from my forehead down to my chin. The wipes were gentle on my skin and after wiping all my makeup off, my face wasn't puffy and red from hard scrubbing. I didn't need to force the wipe to remove my makeup, the wipe glided it off. My skin felt extremely soft with no oily T tone and felt cleansed from dirt, sweat and oil. I would definitely recommend these wipes and will definitely purchase another packet for my gym bag as well. These are by far my favourite. These Micellar coconut cleansing wipes are in my opinion the best wipes I have tried in quite a while. At first glance, the fact that there is a plastic closure as opposed to a sticky closure is one of the things I like most about this product because it makes it so much harder for the wipes to dry out. On opening the product, the first thing I noticed was the coconut scent. I love the scent of coconut and although it was quite strong I didn't find it overwhelming at all and I don't think you would even if you were sensitive to smell. I used these wipes to refresh my face which they worked amazingly for, and I also used them to take off my makeup. It's rare that I find a wipe that can quickly and easily remove an entire full face of makeup but these did just that for me. One wipe and all my makeup had been taken off. I loved these wipes, they didn't irritate my skin, and they also didn't irritate my eyes which is a big plus. I will 100% be rebuying these wipes and I'll be recommending them to anyone I can! I was very excited to try out these Micellar and Coconut Water wipes from Swisspers. I am always on the look out for a great wipe as they are such an easy way to take the day's make up and grime off the face before bed. The wipes themselves come in nice packaging - I love the purple and white, and I also love how the opening is so sturdy. I find the packaging seals shut securely and there would be minimal risk of the wipes drying out. The wipes are a standard size, relatively moist, and only have a faint fresh, coconutty scent. Despite the wipes not being overly moist, I found they still did an excellent job at removing my makeup. I tend to wear a long-lasting foundation, powder, and bronzer on a daily basis - and the wipes take this make up off with ease. What I like most about these wipes is they provide a nice clean without leaving a layer behind and without drying the skin. They leave the skin feeling clean, soft and balanced. Overall, I have been very impressed with these wipes from Swisspers. These wipes would work well for almost any skin type, but I would highly recommend them for dryer or more sensitive skins given the lack of fragrance and the fact they leave the skin feeling so nice after use. Very impressed, will quite happily repurchase! Practically anyone, but would be especially good for dryer and/or more sensitive skin types. Want a quick and effective way to remove your makeup?